Amazing Maria: after Ascot and Newmarket, Deauville! Amazing Maria continues her great summer by winning another Group 1 event in the Prix Rothschild at Deauville, the second at this level. She left a good impression after dominating Ascot's Coronation Stakes winner Ervedya. The latter, grand favourite of the first Gr.1 of Deauville's summer festival and owned by Prince Aga Khan, couldn't resist to the winner in the final stage despite the 3kg advantage offered to the younger contenders. Four foreign colts and fillies took the start in Sunday’s Prix Robert Papin, the very first French Group 2 event for 2-year-olds. It resulted that the first three places were caught by the British interests, the Italian filly concluding fifth. 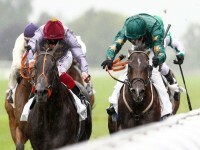 A crushing defeat for the « Frenchies », including Venecia Style, unbeaten in three starts previously and only fourth this time.